Maintaining a clean home is a task that we all face on a daily basis. There are many chores that must be completed each day to ensure a home stays beautiful, including vacuuming. Vacuuming keeps the floors your home clean. We all know that clean floors set the way for the rest of the home, therefore running the vacuum regularly is a must. This requires the use of a vacuum cleaner. It is mandatory to select a vacuum cleaner that really works to keep your home in pristine condition. How is this possible when hundreds of vacuums are on the market from which to make your selection? To the rescue we come, providing you with a list of the very best vacuum cleaners your money can buy! Some are expensive, others are affordable for any budget. But one thing is for certain – they’ll all clean your floors the way that you want them to be cleaned! It is mandatory to select a vacuum cleaner that really works to keep your home in pristine condition. Since there are several categories of vacuum cleaners we will take a look at a couple of the cleaners in each of the categories. After all, we all have different needs. First we will look at the top upright vacuum cleaners as they are more commonly used than the other type. When you want professional cleaning inside of your home, take a look at the shark navigator Professional Lift-Away vacuum cleaner. This lightweight machine weighs just 14 pounds so it can easily be navigated throughout the home. And, it has a ton of benefits with it, too. The vacuum never loses suction, and this is just what you need in a vacuum cleaner. It also features a dust cup with Anti-Allergen complete seal technology to eliminate dust and allergens from getting into the air. The vacuum comes with a bare floor attachments, so if you are looking for an all-in-one cleaner, this is certainly a good choice. The cleaner offers swivel technology so that it is so easy to use, and includes professional on-board tools. It is our top choice vacuum cleaner when you need an upright model. If you don’t mind digging deep into the pockets to buy your vacuum cleaner, consider the Dyson DC 25 Animal vacuum cleaner. Dyson is a leader in the vacuum cleaner industry, known for bringing top of the line cleaners that work amazingly. That brings us to the Animal, a real tiger on the hunt when it comes to getting floors clean. Of course you can expect ‘Ball Technology’ with the Animal, making it smoother and easier to clean all of the floors with ease, even those hard to reach spaces. This is a feature of all vacuums bearing the Dyson name, and certainly a bonus that all can appreciate. 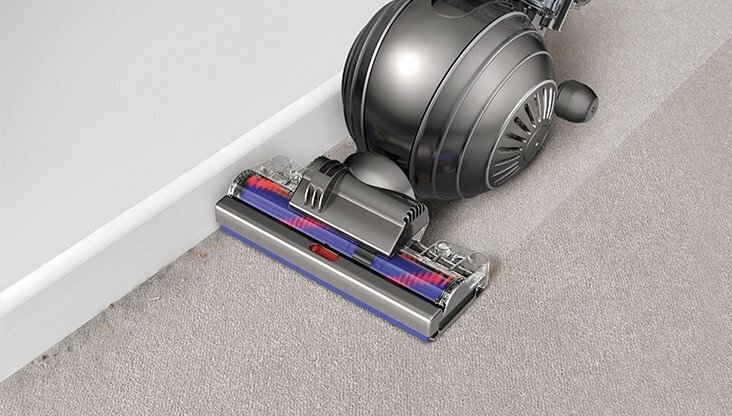 The vacuum offers Root Technology, a feature that helps maintain powerful suction each and every time you vacuum the floor. There is a HEPA-filter inside, and it is approved allergy and asthma friendly. Hoover has been around for what seems like forever, always a leader in bringing us the latest technology in vacuums. People love and trust Hoover for a reason. The company continues to bring outstanding vacuum cleaners our way, including the WindTunnel Multi-Cyclonic upright vacuum. This cleaner has a 4-star rating on Amazon with hundreds of positive reviews from those who have used- and loved- what this powerful cleaner provided to them. What makes this vacuum so special? The WindTunnel technology ensures that even the tiniest of dirt particles and debris are removed from your floors, thanks to the three channel technology. You can see the vacuum cleaner as it whirls around with its cyclonic abilities, crushing dirt along the way and keeping it out of your air and your home. The WindTunnel is affordably priced, offers cord rewind, on-board accessories and long-lasting performance. It is definitely one of the best your money can buy, and you get the confidence of the Hoover name to go along with it. Now we will move on to the next category of vacuum cleaners – stick vacuums. They are popular amongst those looking for a lightweight cleaner for bare floors, hardwoods, rugs and carpeting. There are tons of cleaners considered ‘stick vacuums,’ but none of those are better than the top three! Take a look at the top choices for those in need of a stick vacuum cleaner and make the right decision! The Hoover Linx is one of the most popular of all stick vacuum cleaners. With the purchase you are of course protected with the Hoover name, plus you get a whole lot of awesome features thrown in there for free! The Linx cordless stick vacuum features a changeable 18V battery for powerful suction on all of your floors, including light carpeting. Since it is cordless you can take this cleaner virtually anywhere you want to do without hassle. Other features include an 11-inch nozzle for picking up larger debris; motorized power brush; edge cleaning bristles and affordable price. Amazon readers give the Linx a 4.7 out of 5 stars, and there is a good chance that you will as well. This vacuum is heavenly for anyone who has a pet inside of their home, as it quickly sweeps it away from your life with ease! 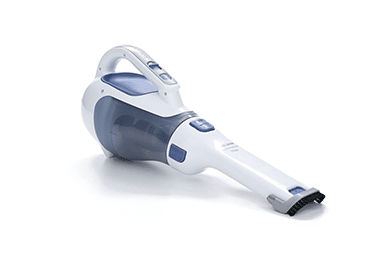 Of course the Bissell name makes you feel confident in the purchase, and with the many benefits offered with this small but powerful cleaner, you can rest assured it is worth your money and more. The vacuum cleaner has a 4.8 out of 5 stars rating on Amazon. It offers features such as a swivel head, easy empty cup, unique design to capture dirt even in those hard to reach places and a lightweight design. It is perfect for light carpet, rugs and bare floors and can easily be used in any room in the home. You can also use the vacuum on upholstery, curtains, etc. to remove pet hair efficiently. This Hoover is even more affordable than the Linx, and certainly a close second in top choices. Amazon users offered the cleaner 4 out of 5 stars, with hundreds of positive reviews also available. The Flair is sold at an unbeatable price, and that is the first thing that so many love about it. Certainly you cannot find a cheaper vacuum that provides such great results. It features a 7 amp motor, lightweight design, 20 foot power cord, EZ empty cup, power nozzle and several other attachments. It is certainly worth every penny that you will spend for it. Now, the third most popular type of vacuum cleaner is the handheld vacuum cleaner. You’ve probably owned a couple of these in your lifetime, as they are the perfect little accessory to quickly clean your car, the stairs, upholstery and many other areas. Times have changed, and now there’s plenty of handhelds out there. Save yourself time and money and buy one of the most popular instead. Here are the three best handheld vacuum cleaners on the market. 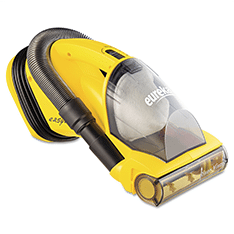 The Eureka Easy-Clean handheld vacuum cleaner is affordable and powerful, a great combination! With a 20 foot cord you can really take this vacuum cleaner anywhere that you want to go with ease. It is bagless and provides a clear dust cup so you can easily determine when it is time to empty. And, it cleans with a simple wipe with a wet sponge! This handheld from Black & Decker is really awesome. It is so awesome that it has earned a 4.8 star rating on Amazon, out of a possible 5 stars! Since it is cordless there is no fussing with a cord or worry of it getting tangles and twisted. This also allows you to do more with the handheld cleaner than what you could with a corded model. The DustBuster uses cyclonic technology to quickly pick up all of the dirt, dust and debris from you floor while eliminating allergens from emitting into the air. If you have allergies or asthma, or are someone who is concerned with their health, this is a benefit you can appreciate. The Dustbuster is affordable, powerful and a cleaner that you can really count on to deliver results. The third most popular handheld vacuum cleaner comes from Bissell and is known as the pet hair eraser. It is appropriately named, as the vacuum features a pet hair nozzle that actually attracts pet hair so to remove more from your floors, car, upholstery and other areas. 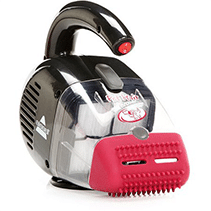 While it picks up pet hair wonderfully, the tiny cleaner is also strong and powerful and a mean machine at picking up other dirt and debris from all areas. It is designed to be lightweight and portable for use anywhere life takes you. Thanks to the cordless design this is more than possible. Canister vacuum cleaners are those using a canister and a hose to keep your home clean. These vacuums are the fourth type of cleaner available, and very popular as are all of the brands. Here we will look at the top canister vacuum cleaners. The Mighty Mite is the top of the line canister vacuum cleaner that does it all! For a cost way less than $100, you can own this vacuum cleaner and enjoy amazing benefit after benefit. On Amazon, the Mighty Mite vacuum cleaner has a 4-star customer rating with tons of great reviews to back it up. 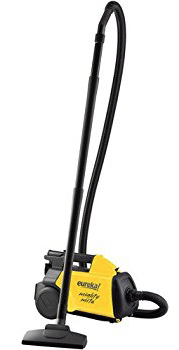 Not only is this cleaner lightweight, it is also tough, with a powerful 12 amp battery. Customers really love the PowerTouch handle that lets you clean all of the floors in your home with ease. There is a 20-foot cord and a blower port. 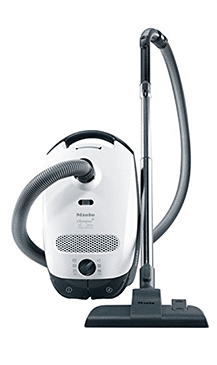 A pricier selection, the Miele canister vac is worth every single penny because it works like a charm inside of your home. It is one of the lightest vacuum cleaners of its kind, making it easy for anyone to easily move from room to room. There is a six-setting suction power option, as well as a 29-foot hose so that you can easily clean tight corners, crevices and even upholstery and curtains with ease. There is a 7-year warranty included with the vacuum. With this information it is easy to see which vacuum cleaners are worth your while. These choices are the top sellers and most popular for a reason, and it is a good idea that you look at these choices when you want to make the most of your floor cleaning experience and spend your money wisely.